We’ve all kept things to ourselves while we figure them out. And often, the figuring has most to do with how to negotiate our peculiarities in a hostile world. As a child, Galloway was confronted with a number of circumstances that caused her silent contemplation. Now that she has a few things figured out, she’s telling the story. And the ways she’s navigated the shames and epiphanies of her early life will prompt you to see your own social negotiations more clearly too. These are the quick facts of Galloway’s tale: an experimental drug injected during her mother’s pregnancy caused Terry to see visions and begin going deaf in childhood. Her boyish nature was curtailed by disability, but that didn’t stop her burgeoning desire for other girls. Galloway discovered the value of drama in managing her life, but she quickly learned that theater is more business than art. A deaf woman was not expected to take the stage. Some of these circumstances caused Galloway confusion, pain, shame, frustration and yes, meanness. You can relate. I know you can. She also gained strength from isolation. This quote, from Galloway’s introduction, makes a promise, on which she delivers: her myriad fascinating complexities will help you know yourself. One of the most compelling aspects of the focus on meanness (for this femme dyke at least) involves the emergence of Galloway’s angry butch dyke. Her analyses of gender – through the storytelling – are flawless as she conveys her friendship with a group of local boys. “I might love the girls but I lusted for power,” (39) she shares. Galloway developed the compassion that comes from being both oppressed and oppressor – seeing the weakness in another as she conquers it, while still feeling conquered as well. The Drag Acts chapter offers more solid, reflective storytelling – from butch-femme desire to the personal negotiations of what is “real” rather than “performed” in intimate moments. These stories revolve nicely around theatrical ventures and the personal relationships that accompany them. And then, the story lags a bit through the final third of the book. I would’ve been happier with a focus on her theatrical ventures, how they invoked and portrayed gender, sexuality, madness and disability. Instead, the last third of the book tries to do too much. It encapsulates a whole life since childhood rather than focusing in on the most compelling aspects of the story. Still, piecing a memoir together is an artistic venture and so I want to allow a bit of unruly passion. 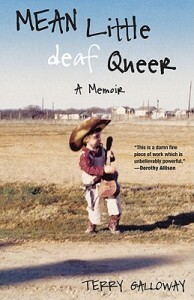 The many brilliant chapters make Mean Little Deaf Queer well worth the read. Kimberly Dark is the author of five award-winning solo theatre shows and other anthologized poems and stories. Find her at www.kimberlydark.com.